Thanks to the especially awesome vibrational fields generated by Florida bees, anoles & box turtles, I finished the St John Passion setting for St Paul's, late this morning. It's the largest-scale choral music I've written to date, and although I originally thought of making (some, spare) use of instruments, I wound up concentrating on writing it purely as an unaccompanied delivery of the text. Which means that, for this inaugural performance at least, I'm scrapping some curious noodly writing which, actually, I rather like. The ink on the final double-bar is still fresh, so I will see what my thoughts are like in a couple of days . . . for this Good Friday, maybe I will leave it as a purely choral piece . . . or maybe just have some brief harp bits as a kind of understated punctuation. purely as an unaccompanied delivery of the text. Had an interesting conversation with a Gopher Tortoise yesterday . . . .
Merci, mon vieux! I sang through the piece quietly, start to finish, earlier this morning to get a notion of overall duration. Thinking right now that instruments would only be interference, in the case of this setting. I will find another use for the noodling . . . .
All right, I've plunged into the Finalification of the new 32 pp. of MS.
And have discovered (what I had somehow forgot) that I still need to import most of the text, with hyphenated syllable-breaks, into Finale. Not a serious setback, since I have already worked on this more than I was planning to, for this evening. 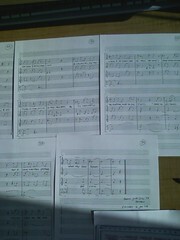 Up to p. 14 of the draught finished score. It seems to mean significant progress from p. 1. How much progress to the end, neither of us knows. The final score will run to at least 40 pages, I should think. So, at all events, much work yet to do. I don't know, it's hard to tell, but have you "used too many notes"
Any extraneous notage, I relied upon the Florida sun to bake off . . . . It runs to 50 pages, total, mon vieux. I wound up needing to add notes (the text which I've been carrying in my notebook for months, was missing six verses, the Burial). Mostly composed this Real Ending last night. Got a very nice message from Paul Cienniwa, director of First Church in the Back Bay. The ladies of his choir sang the SSA version of the Alleluia in D this Sunday past, and Paul said that, "not surprisingly, it was a big hit." Reading the fine score of the St John passion written by our own Karl Henning, and send to me out of his kindness. I am playing it on the piano, and singing along. I had not so much pleasure reading a modern score since ages. Yes, I was also kindly sent a copy of the score - I've told Karl how impressed I was with it in private, but I should also put my praise out here too! I haven't had a chance to play through it yet, but I am really looking forward to it, as the piece looks elegantly conceived and beautifully executed.